What a great day to post this! I’m headed home from Boston, and sincerely hoping that I need not loathe nor fear any of the experience. We’ve tackled the unpleasant topic of air travel a couple of times this summer. As a subject of interest, it won’t go away. A couple of recent cases in point, about a week old, but worthy of attention nonetheless. When Marion C. Blakey took over at the Federal Aviation Administration in 2002, she was determined to fix an air travel system battered by terrorism, antiquated technology, and the ever-turbulent finances of the airline industry. Five years later, as she prepares to step down on Sept. 13, it’s clear she failed. Almost everything about flying is worse than when she arrived. Greater are the risks, the passenger headaches, and the costs in lost productivity. Almost everyone has a horror story about missed connections, lost baggage, and wasted hours on the tarmac.. More than 909,000 flights were late through June of this year, twice the level of 2002. There was a time not long ago when the head of the FAA would be the last person you’d expect to express public doubts about potential catastrophe. Today, Blakey is unabashed about the rising risk of flying. There have been 339 incidents so far this year where planes got too close to each other or to objects on the ground, up from 297 in the same period last year. On Aug. 16 a passenger jet on the runway at Los Angeles International Airport came within just 37 feet of another airliner—the eighth such incident this year at LAX alone. So why is it that we can put a man on the moon but can’t fly him from Atlanta to Charlotte, N.C., without at least a two-hour delay? While Blakey bears some responsibility for the abysmal state of air travel, she follows a long line of FAA chiefs who failed to put much of a dent in the agency’s to-do list. It’s not a lack of money. Last year the FAA did not spend all of the money it was allocated. Nor is it a lack of knowhow. 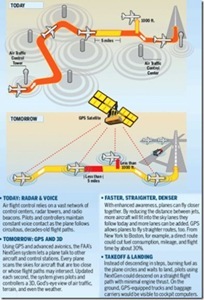 Existing technology could easily meet the demands created by the exploding number of fliers. Nor, for that matter, is it security concerns. Instead, it’s a fundamental organizational failure: Nobody is in charge. The various players in the system, including big airlines, small aircraft owners, labor unions, politicians, airplane manufacturers, and executives with their corporate jets, are locked in permanent warfare as they fight to protect their own interests. And the FAA, a weak agency that needs congressional approval for how it raises and spends money, seems incapable of breaking the gridlock. “The FAA as currently structured is impossible to run efficiently,” says Langhorne M. Bond, administrator of the agency from 1977 to 1981. The balance of the story is useful, but check back here after you take a look at it, and let’s compare notes, shall we? Regardless of what is or isn’t causing this climatic weirdness, its impact wouldn’t be half so bad if not for the staggering volume of air traffic attempting to navigate through and around it. I’ve never seen anything like it. Long waits and holding patterns are routine now, even on clear sunny days. And an ever-growing percentage of that traffic is made up of regionals. Check out those evening conga lines at Kennedy, and you’re liable to spot a 500-passenger Boeing 747 sandwiched between four 50-seaters. Elsewhere it’s similar. At LaGuardia and Washington-National, the number of RJs and, to a lesser extent, turboprop feeder craft, is astonishing, often outnumbering the Boeings and Airbuses of the majors. Smith’s thesis is that the airlines have systematically downsized aircraft, in order to fly fewer empty seats, and as a result ever more passengers are being flown in ever smaller airplanes, cluttering up the taxi lanes in the ways he and Business Week illustrate. The system is broken, and we beleaguered passengers are caught between the gears. Because, just like with our lead-painted toys from the home of always low prices, we passengers demand the absolute lowest fares, regardless. You have the right to remain silent. Anything you say or do while imprisoned within the air travel system can and will be completely ineffective. You have the right to get to the airport very early, only to find that your trip has been canceled. You have the right to accept the excuse for that cancellation or not, whatever. 20. You have the right to stay home. This entry was posted on Friday, June 13th, 2008 at 5:00 pm and is filed under Business, Politics, Travel. You can follow any responses to this entry through the RSS 2.0 feed. You can leave a response, or trackback from your own site.